As I previously mentioned, Thor can have more than the standard known 3 simultaneous OSCs. One of Thor's components that can be used as an OSC is the LFO. If you look closely at the available LFO rates, you'll see that the rate can be pushed to audible frequencies (so it's not as "Low Frequency" as one would expect, uh? ;). LFO1 is easy to sync to the keyboard input, making it possible to control its frequency in the usual musical scale. To do the same with LFO2, you'll need to make some modulation routing. The Pitch-Wheel can also be added to the mix, to control both LFO's like a normal OSC. This will allow you to use the available LFO waveforms, musically, and with careful planning, an LFO can be a quick way to add a sub-OSC without sacrificing a regular OSC or resorting to a multi-synth Combinator. So, 3 OSC + 2 LFO's that's 5 "OSCs" right ? We're missing 2 more, uh? Self-Oscillating Filters (and the Comb Filter too, because of its special characteristics) can also be used as rudimentary OSCs :) ...do some experimenting and you'll see how easy it is to do so, locking the filter frequency to the keyboard tracking, so it can also be played musically, like any other OSC. One thing to keep in mind is that, any component in the "dark/black" slots of Thor, is polyphonic, i.e. it'll have as many simultaneous instances triggered as there are notes played, the limit being what's set as the maximum polyphony. This makes the 3 OSC's, Filter's 1 & 2, the LFO1 and the Mod, Filter and Amp Envelope Generators, "polyphonic". The same doesn't apply to Filter 3, Global Envelope and LFO2, making it "monophonic". This is why this patch mentions "6 poly OSCs + 1 mono OSC", where the mono OSC is LFO2. 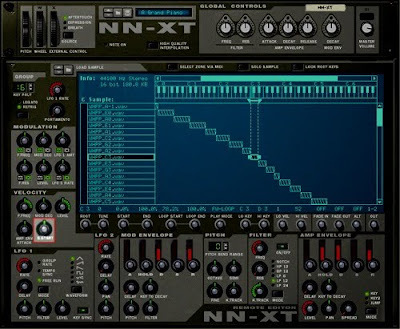 Turning the NN-XT's Velocity S.Start all the way to the right will mimic the NN-19 Sample Start behavior, controllable by the CV values sent to the Gate CV input at the back of the NN-XT. 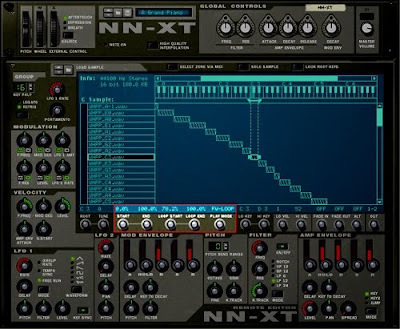 Paul Hardcastle's "Na-Na Na-Na Nineteen"
You know that Thor can have up to 8 independent built-in OSC's, 6 of them being polyphonic, don't you? Sorry, but I only have time to show what's possible to do with some of the available rack devices, to show the CV values, like I mentioned in my previous post. As soon as I have the time, I'll explain in detail how to achieve each of those unusual device uses. It's quite simple, as many will quickly figure out. Some of you may already use something similar to do your CV debugging, like I do.